List and discuss the starting points of the line of Saturn. The line of Saturn is comply called the fate line and it represent the pattern of living. Starting from the life line – self-reliance in searching for a career. Moral support from family or friend is helpful but not necessary. Beginning inside the life line – the subject either receives or needs parental assistance or guidance by way of financial help towards an education or career in business or a profession. Starting from the base of the palm near the wrist lines – a line of luck whereby the subject follows a pattern of living or career with little resistance or effort. Starting on the lines of the wrist – obstacles must be overcome before success can be achieved. From Luna area, lower side of the palm – imagination and restlessness play a strong part in the formation of the future of the subject. With a good head line and a prominent Luna area nothing with hinder the way to a desired goal for success. The lower the line, the more creative ability. Starting from the head line – a career or arrange can take place later in life and can have equal success and happiness. A short line like this often accompanies a long Saturn line right beside it, indicating a second career or major interest. List two terminations of the line of Saturn. On Saturn area under second finger – always a need to understand human relations. Early responsibilities may continue many years. On Jupiter area under first finger – ambitions that must be satisfied in a profession or business, security and a good home. Where is the termination of the line of Apollo? Termination of the Apollo line is under the third finger (Apollo mount area). Ending at the heart line – marriage may end the career of a woman. For a man, a change in career. List and discuss the lines of Mercury. This is also known as the line of health. From the wrist, above the wrist line – the normal starting point, signifying health and success. Independent by nature so tends to overdo work or pleasure resulting in physical depletion. From the life line – ailments in the digestive system. From Luna – restlessness. Desire for constant change. From the middle of the palm – a period to begin an interest in an enterprise. constitution with good business acumen. A long solid line ending under the little finger, Mercury area – want quick results and compensation in hard cash. NEdd to conserve physical energy. Ending at the head line or the heart line – general activity may lessen or stop, depending upon health or occupation. Give a brief outline to the Cephalic Line. The cephalic line is parallel to the Mercury line towards the percussion side of the palm. This line indicates a physical reserve that can act when the Mercury line shows a weakness. When exactly parallel it foretells a craving for sensual pleasures and greed for wealth. This entry was posted in Palmistry and tagged Mercury, saturn on August 11, 2016 by The Magician. Life Line: health, vigour, strength and longevity. The Life Line normally joins to head line in the beginning. Head Line: mentality, degree of intelligence and application. The Head Line nornally joins to the life line in the beginning. Heart Line: the emotional and physical strength dependent upon the heart itself. The Heart Line normally begins on the base of the first finger called the area of Jupiter. In the Life Line, what would suggest impulsiveness? When the Life Line starts off separated from the Head Line, it would suggest impulsiveness, full of energy and independence. In the Head Line, what would suggest mental or physical problems? When the appearance of the Head Line is chained, it suggests poor mental stability and uneven temperament. In the Heart Line, what would suggest indecision in choice of love? When the Heart Line appears wavy, it would suggest indecision in choice of love. Draw your own palm, show the Heart, Head and Life Lines and write down what these say about you. Life Line: it has normal beginning, joined to the head line – a constructive planner, one who proceeds with cautions study. It joined to the head line with netted lines – need to consider every step before acting on any venture. It is a long line ending near the wrist – validity can extend well past age 70. The appearance of life line is chained, indicating uncertain physical weakness. There is a split line near the end, indicating illness or period of change. Head Line: it has normal beginning, joined to the life line, just touching it and halfway between thumb and forefinger – cautious. The line is long – good mental power, very capable, sensitive under strain. It drops down to the luna as a solid line – an indication of imaginative and creative. The beginning part of the head line is chained showing poor mental stability and uneven temperament. Heart Line: it starts between the first and second fingers – a very practical form of love that combines sympathy with emotion, sensual and tolerant. It terminates at the percussion which shows good emotional balance. The line is chained, which indicates fickle and unfaithful love. Islands are found along the line which advise misunderstandings will lead towards separation. This entry was posted in Palmistry on July 10, 2016 by The Magician. What can Palmistry do for you? This is a wonderful subject. Because it can do so much. Reading a hand is like reading a book, but this book is about you – the most interesting and important subject to know about. The hand will show you your strengths, your weaknesses, your talents, where you need help, where you will excel, periods of ease, advancement and difficulties. And it will show you the tools to overcome those difficulties. Know thyself, as advised by the Delphi oracle as the one thing we should all do in this life. To know one self is the key to self-realisation and probably this is the main purpose of the palm to help you to be the best version of you, your unique self you can be. There are many ways to look inside, but to me palmistry is one of my favourites because at a glance you will know deep things about yourself. In the modern world not only ourselves, but others are important to understand. By reading the palm you will know instantly things that might otherwise take months to know. How nice it would be for people to be able to reflect themselves as the person who would appreciate being seen as who they are. You will know the best way to approach people by cutting to the chase with surprising accuracy. The hand will let you know the best way to approach any person and it is invaluable when choosing an employee, or finding a romantic partner. You will be able to see the soul of the person through the palm. Palm reading – or palm listening – is a pleasant way of getting closer to other people. Whether you use it as a party game, a way to size up potential friends or business associates, or a tool for self-knowledge, you will always end up feeling your heart more open to humanity. If practised in a spirit of humanity and from a sincere desire to hear other people’s stories and sympathise with them, palm reading is an endless source of pleasure and interest. You can watch your own hands change, and there are twice as many other palms to read as there are people in the world. Every hand tells its own story, yet all hands are fundamentally similar. Focusing on the hands is one of the many ways to appreciate the diversity and unity of human beings. This entry was posted in Palmistry and tagged hand on May 29, 2016 by The Magician. Give a brief outline of what you understand Palmistry to be. Palmistry, like medicine, is a pragmatic thing – the result of an attempt on the part of mankind to create order out of chaos, to find meaning and significance in an outward form. Palmistry consists of a series of hypothesis – and it is right that these should be open to criticism. We maybe wrong in the individual case, but general experience shows that on the whole it is correct to connect the two. 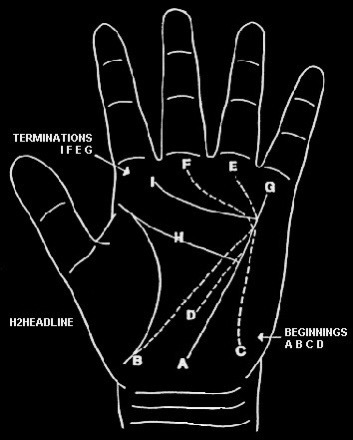 What are the two categories of Palmistry called? It deals with the shape of the hands and the fingers. It deals with the lines and markings on the palms. By now you should have an understanding of the seven types of hands and have been able to see which type of hand yours is! Give a detailed explanation of the shape and characteristics of your hand. I have conic hands. It is proportionately of medium size, the palm is a little tapered towards the fingers, which are slightly pointed at the tip. These people are artistic, original, talented and often inspired; many have powers of extra-sensory perception and are particularly susceptible to precognitive dreams and clairaudience. My hands are full and soft, these people are luxury loving and indolent without the drive or energy necessary to complete a task. Those with conic hand are sympathetic, impulsive and extremely generous to friends and loved ones in need, they have little patience with prejudice, deplore lies and dishonesty, and are generally very difficult to deceive. They are clever, think rapidly and possess the ability to quickly grasp the fundamentals of a subject. When is the term ‘long finger’ applied? The term is applied where the middle finger equals the measurement of the palm. What observations do we obtain from the Little Finger? The little finger dedicated to Mercury shows how well the subject is able to get on with others. If it tends to separate from the third finger it indicates difficulty in forming emotional attachments and a reluctance to express true thoughts and feelings. A long top or nail phalange means a good command of language, if the finger appears a little twisted it can apply untruthfulness. What hand type or shape is the rarest and most beautiful to find? What are the characteristics of a Flabby hand? May be lazy and indifferent. Strength of mind depends upon the lines and signs in the palm. Often find a lucrative way of living. Incredible moods and temperament. What do the ‘mounts’ refer to? It is the area beneath the fingers. This entry was posted in Palmistry and tagged cheirognomy, cheiromancy on May 10, 2016 by The Magician.